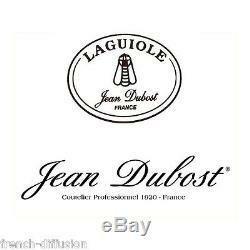 Complete LAGUIOLE Jean Dubost cutlery/flatware set. For 4, 6, 8, 10 or 12 people. In HEAVIER 25/10 stainless steel. 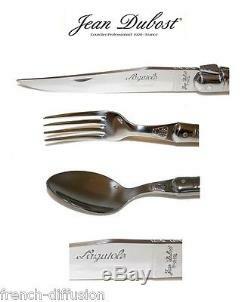 Exclusive LAGUIOLE Jean Dubost cutlery/flatware sets. Each person: 5 pcs setting. (dinner knife + dinner fork + dessert fork + soup spoon + coffee/dessert spoon). 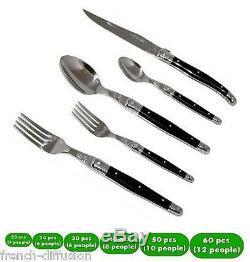 Cutlery/flatware set for 4-6-8-10-12 people. 0 4 people (20 pcs set) 0 6 people (24 pcs set) (no small forks) 0 6 people (30 pcs set) 0 8 people (40 pcs set) 10 people (50 pcs set) 12 people (60 pcs set). Made from HEAVIER 25/10 stainless steel. For the 10 differences between 15/10 and 25/10 stainless steel. 25/10 stainless steel with ABS (acrylic) handles - stainless steel ends and rivets - blade : 2.5 mm thickness - famous Laguiole Bee. Knife : 22 cm (8 3/4") 60 grams - large fork : 20.5 cm (8") 60 grams - small fork : 16 cm (6 1/2") 25 grams - large spoon : 20.5 cm (8") 70 grams - small spoon : 16.5 cm (6 1/2) 30 grams. Manufactured in France - delivered from France in Kraft box (40/50/60 pcs sets in two boxes) - with Certificate Of Authenticity. ALSO AVAILABLE IN OUR SHOP ("FRENCH-DIFFUSION"). Please note : According to English law, we have to add the following product-information : all our knives have a fixed blade (4 inches/10cm) - they are NOT folding knives. For our full complete genuine LAGUIOLE cutlery + steak knives range : please visit our shop (" FRENCH-DIFFUSION "). 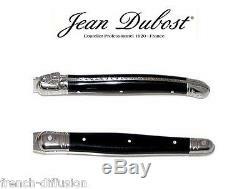 The item "Authentic Laguiole Dubost CUTLERY set 25/10 BLACK (4 to 12 people) from France" is in sale since Saturday, January 07, 2017. This item is in the category "Home, Furniture & DIY\Cookware, Dining & Bar\Cutlery\Cutlery Sets & Canteens".